An index of the state of certain suburbs of American poetic culture is Charles Simic’s reading Charles Reznikoff’s monumental work Testimony “for the first time” (!) on the occasion of Black Sparrow’s reissuing it in one volume. However belated, his praise is testimony itself to his acuity and the work’s enduring power. A very interesting (and hefty!) 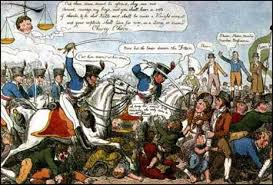 post on Objectivist poetic practice in England, here John Seed’s poem on The Peterloo Massacre composed from tesserae of existing documents. Read it here. Richard Hyland, Distinguished Professor, Rutgers Law School, Camden, New Jersey, has compiled the fullest account of the sources of a Reznikoff poem, together with a detailed commentary on theAmelia Kirwan case and the poem Reznikoff wrote based on this case. Many of Reznikoff’s poems, especially those in Testimony, are based on legal records. But there has been little research on the exact relationship between the legal record and the poem, with the general assumption that Reznikoff used only language from the legal records, cutting away but not adding any of his own words. The key to Reznikoff’s aesthetic is his selection and condensation of the source materials. The Allen Ginsberg Project has thoughtfully posted a recording of a reading in honour of American Objectivist poet Charles Reznikoff, the promise and possibilities of whose work are, happily, increasingly appreciated, from yesterday’s late Beats to today’s Conceptualists and more direct descendants, such as Michael Heller (whose volume of collected poems This Constellation is a Name was published just last year). The Objectivists’ fame has reached even to Russia: Kirill Medvedev (a very compelling figure in his own right) reflects on their legacy in his poem “The End of the Ceasefire (The End of the Objectivist School?)”. Perhaps with the excesses of Capital and America’s warmongering Reznikoff’s executors will feel the time is ripe to reissue Reznikoff’s cold-eyed, unrelenting castigation of exploitation and racism, Testimony. (My difference of opinion with certain latter-day receptions of Reznikoff’s work can be found here).